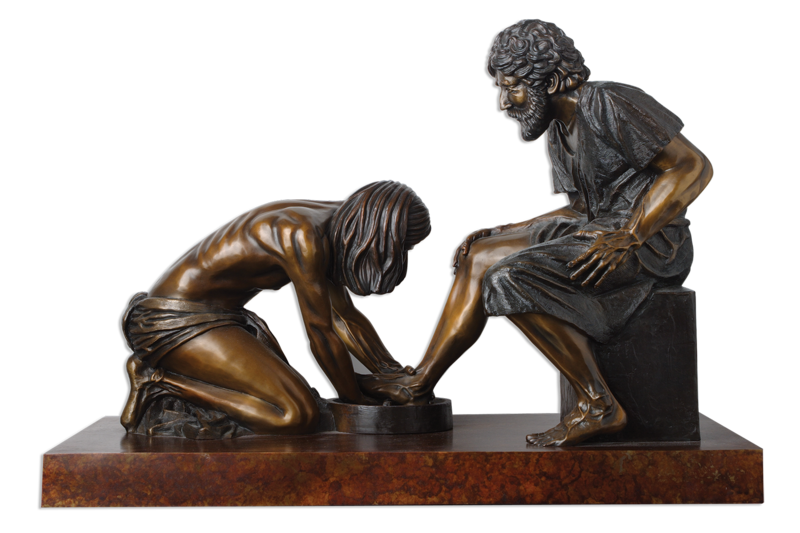 A small replica of this statue with Jesus washing the feet of His disciples sits in my office, and you will find a larger one outside our chapel here at your Home Office. Philippians 2:5-11 is one of my favorite passages in the Bible because it depicts how Jesus modeled the type of service we should live. Jesus’ example: He opened their eyes with faith, their ears with truth, their hearts with love. He asked for no honors for himself. He met their needs and fulfilled their hopes. He changed their lives. That is the model for real success—these are the things that will bring joy, peace and hope. Serving others as Jesus modeled is the heart of Premier. We believe that serving others is the road to success, in building a life as well as in building a business. We go into homes, not only to show jewelry, but also to minister to people who have real needs. We are to invest in the interests of others, consider their needs more important than our own. It is so fulfilling to see others get excited and get into Premier, catch the vision, and succeed. Caring and serving don’t mean we are perfect or that there are no problems. It doesn’t mean we do everything right. We will, and do, make mistakes. However, our Purpose remains the same—to enrich every life we touch—and we do this through serving and caring for others. This is how we measure success—not by how many servants you have but by how many people you have served. We have beautiful merchandise. We are proud of our jewelry and we want others to like it and buy it, but just remember, you can lose everything on this earth except the investment you make in others’ lives. People, not product, are the most important thing at Premier. Fall is almost here, the best time for your business. We sure are excited about all of the opportunities to serve your Premier family, your Hostesses and your customers! Our company is great because we are able to “touch lives” and minister to and serve all. We are thankful for all of you! Fall is “Super Service Time.” HAVE A GREAT ONE! I never want to be without Premier! Love Andy’s words of SERVICE! Fall is SUPER SERVICE TIME!!! Thank you Andy, for never changing. Consistently leading us to Christ. what an amazing role model you have been thru the year! I joined Premier to make extra income. I am committed to Premier because of the heart of Premier. Premier is teaching me how to live a life of service. Providing SERVICE with excellence is a great opportunity.